Topics: (elite/liftmaster), Faac, Doorking (dks), Linear, Hysecurity, and Reno A& E.
The site has about 70 users daily, viewing on average 1.40 pages each. 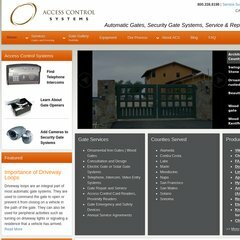 sonomaaccesscontrolsys.. "Garage Doors and Automatic Gates" - Sonoma Access ..
Its 3 nameservers are c.auth-ns.sonic.net, a.auth-ns.sonic.net, and b.auth-ns.sonic.net. Sonic.net Inc. California is the location of the Apache/1 server. PHP/5.2.11 is its coding language environment. PING parked.sonic.net (209.204.175.65) 56(84) bytes of data.